Saturday night Central Baptist Palmyra held its third annual Chili Cook Off in support of Baptist Camp Lebanon's “Cedars of Lebanon 2020” campaign. On May 13 Central Baptist of Riverton-Palmyra will be hosting their Third Annual Chili Cook Off to support Cedars of Lebanon 2020. This year two of ABCNJ's finest, Rev. Randy Van Osten of First Baptist Church Pitman and Rev. Chaz Hutchison of Scotch Plains Baptist Church, will be contributing chili to enter the competition. Come out to support a great cause and some of ABCNJ's finest cooks at the same time! First Baptist Church of Allentown, New Jersey has exceeded it’s pledge of $10,000 in just four years with proceeds from our Souper Saturday Event at the end of February this year. Our original pledge was to raise $10,000 between 2014 and 2020. After just four of those seven years our donation to Cedars of Lebanon is now $12,100.69! Not only have we fulfilled our pledge, we've *exceeded* it! Testify! Devotional eBooks are available! Would you like to support Cedars of Lebanon and grow in your faith at the same time? Have you been interested in ABCNJ’s Testify! devotional, but prefer eBooks to print? Have you already purchased the book, but find yourself wishing it was easier to bring with you, wherever you go? We have some great news for you! Testify! eBooks are now available! Note: If you have already purchased a copy of Testify! you may skip step one, but donating again is never discouraged. Step one, make a donation to Cedars of Lebanon. Use the button below to go to ABCNJ's online donations page. Make at least a $10 donation, and in the box marked "Please direct my donation to" select BCL: Cedars of Lebanon 2020. Use the buttons below to choose either ePub (Nook, Sony, iBooks, Google Play Books) or Mobi (Kindle) format and download your book. That's it! The books do not come with digital restrictions management (DRM) applied and are free for you to use on any personal device you wish. We do ask, as the proceeds for the book are going toward Cedars of Lebanon, you do not share the files with others. But please do encourage others to donate to this worthy cause! The members of First Baptist Church in Allentown, a small congregation in the central part of our region, decided to do something "big" for Baptist Camp Lebanon. They sponsored a Souper Saturday fundraiser event on February 22, and invited the community to come for good fellowship, food and shopping. Local businesses set up tables (and made donations), and the variety was excellent. Enthusiasm ran high, and they reached their first year pledge goal to the ABCNJ Cedars of Lebanon 2020 endowment campaign - raising $1,454. Dr. Lois Spitzer, our Senior Regional Pastor's spouse, expressed the Spitzer's support by making a potful of matzo ball chicken soup! Rev. Leslie Martin, pastor of FBC Allentown, reported that it was the first soup to completely sell out - even before lunch hour! All of the soups smelled great and were supplemented by breads, bagels and pastries. We were truly blessed today with good attendance, including our ABCNJ family, you and Lois and Josh, Camp Lebanon Director Don Smith and Katie and their daughter Sarah, President Paul Hart and Judy Hart, Rev. Dr. William Webb and his wife Martha, and Rev. April Van Ness. Rev. Van Ness brought with her many of the Memorial Baptist Church members. The Allentown United Methodist Church Pastor, Rev. Fran Ballinger attended and brought several of her church members too. Also, our church members and their families, our friends from Allentown and beyond, several vendors and merchants all came out to support us today. 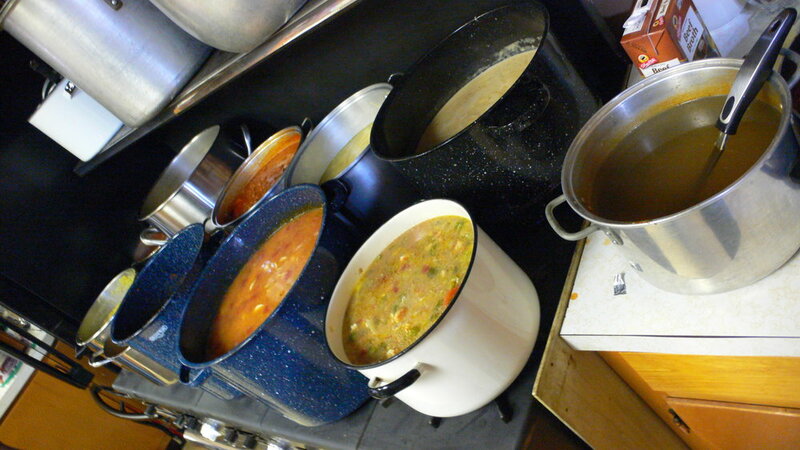 We had a steady stream of people coming in to enjoy the wonderful special soups from 10 to 3. Some ate at the church with us, others took containers home. The Tricky Tray drawings helped significantly in raising funds. Our little church is blessed with hard workers, and they dedicated themselves to making this event a success. Praise the Lord! The Cedars of Lebanon 2020 endowment has been established to ensure that future generations of New Jersey children may benefit from a week of Christian summer camping, regardless of ability to pay. Launched at the ABCNJ Annual Session in September 2013, individuals and churches have given and pledged over $250,000 so far! The FBC Allentown donation from Souper Saturday represents the fulfillment of year 1 of their pledge goal of $10,000. The region is asking every ABCNJ church to pledge - with a suggested challenge goal of $10,000 or more. We are also accepting donations and pledges from individuals. One time and repeat scheduled donations can be given online by going to www.abcnj.net and clicking the "Donate Now" button at the bottom of the home page. It only takes a moment to make a donation and your transaction is secure. It snowed again last night. This Winter we have already set records for both snow totals and low temperature. We have seen freezing rain, black ice and piles and piles of snow! Tree branches are being ripped off of the trees creating days and days of cleanup...when it gets warmer. We have faced frozen pipes, frozen drains and a shortage of rock salt. Our plow truck broke down and my furnace blew up! Shoveling, then shoveling again. Plowing with a 1953 Massey Ferguson tractor that simply cannot handle big or heavy snows. Punxsutawney Phil (the groundhog) should consider himself lucky that I live in New Jersey! I am so ready for summer! Even with all of the winter weather I have already begun to focus on warmer thoughts! The Cedars of Lebanon campaign passed $250,000.00 in pledges! If that doesn't warm you up then you may be locked up in the deep-freeze that has been this winter. Summer camp really is not that far away. Now we are getting heated up! I have begun to look to hire a summer staff to prepare the way for a new crop of campers. Warmer and warmer. This past week our first camp registration arrived in the mail. It is starting to really cook now! I already am feeling warmer...or could it simply be the heater under my desk? Now is the time for all of us to think warmer thoughts. 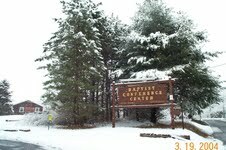 As you think warmer thoughts I hope that Camp Lebanon is a part of those thoughts. We need your assistance as we seek to fund a future with the Cedars of Lebanon campaign. We need your help in finding a great staff for the summer of 2014. We need your attendance as a camper of a volunteer for a week or more for another great summer program. Above all else we need your prayers for God's guidance and blessing as we seek His will. Dear ABCNJ Family, I am excited to share with you that ABCNJ's Cedars of Lebanon 2020 campaign for our Baptist Camp Lebanon has just crossed the $200,000 level in gifts and pledges - in less than 2 months! Total Pledges and Gifts: $204,552 (10.13% of our goal)! We are asking for every ABCNJ church to pledge to raise $10,000 or more by 2020! Our short-term goal is to have 100 commitments from churches by Easter Sunday, 2014. Individuals are also encouraged to pledge and donate cash or stock, to place Lebanon in your will, or to create an annuity with camp as the beneficiary. The American Baptist Foundation will help you do this!